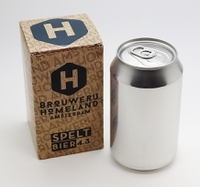 18 Jul 2018 --- Dutch craft beer brand Brouwerij Homeland Amsterdam has collaborated with Ball to create a unique, blank can design for its popular spelt beer. The cans utilize Ball’s 33-centiliter standard format, which is a popular choice amongst many craft brewers. Unlike other brands, Brouwerij Homeland Amsterdam has chosen to leave the 360-degree can canvas blank, creating a strong, stand-out design. The minimalist cans feature no printing or messaging, other than the name, date and alcohol percentage on the bottom of the can. This type of design-led packaging is important within the craft beer industry, as the beers are primarily brewed for taste rather than volume and result in unique products that demand equally unique designs. Craft beer is a booming industry as consumers are increasingly demanding more authenticity, choice and flavor options. What’s more, cans are also becoming increasingly popular for brewers, as they provide easier recycling opportunities than glass and are cheaper to ship due to their lightweight attributes. “Using a can protects the beer from light and oxygen, ensuring ultimate preservation, and its lower weight optimizes space on shipments to reduce pollution,” Stephan notes. “We believe that the beer maintains that great fresh taste for longer as the cans seal better without any light being able to reach the beverage inside. The use of cans also helps us to become more environmentally friendly as they recycle and transport more efficiently in comparison to bottles,” he says. “Craft brewers are extremely proud to brew their own beer, selecting the finest ingredients for their bespoke formulation in order to stand out in a crowded market. The can ultimately protects the beverage and is the iconic format for beer at this time, especially the 33cl standard can,” she tells FoodIngredientsFirst. The cans are now available in supermarkets, bars, restaurants and hotels in The Netherlands. Elsewhere, Ball has teamed with Ovayaco, a company that produces and supplies beverages to Moscow-based restaurant chain BlackStarBurger, to design a new stand-out can using the innovative Strawster technology. Strawster is a modern gadget available exclusively in Ball’s 25cl slim can which features a self-activated straw that “magically” appears once the tab of the can is engaged. The partnership cites the increasing demand for ready-to-drink beverages and energy drinks in Russia as the drive behind the collaboration. 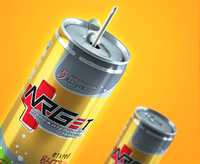 Click to EnlargeOvayaco has introduced a new caramel flavored energy drink called NRGet to the Russian market. The drink’s functionality is based on five natural extracts of guarana, ginseng, Eleutherococcus, maral root and St. John's wort. “We chose the Strawster as it is both unique and fun and allows us to offer something different to other energy drinks brands on the market,” says Ilya Manthay, General Manager at Ovayako. To further advance Strawster's appeal, Ball can also laser logos, simple images and messages directly onto the exterior of the straw, offering a fantastic point of difference to customers. The cans will firstly be sold in fast food restaurants, later followed by supermarkets.